Farewell 2012. Come in, 2013! 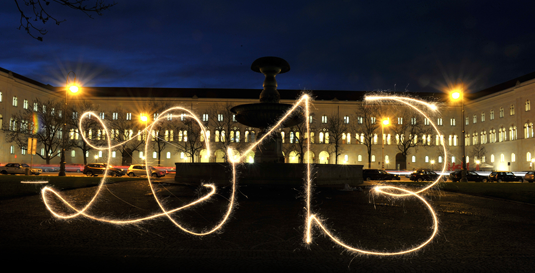 LMU casts a backward glance on an eventful year, and wishes you all a successful start to 2013. To put together a short review of LMU’s year, as 2012 draws to a close, means leaving out a lot. Almost every day, the doings at Germany’s largest university include newsworthy items that would deserve mention in such a survey. In this Spotlight we present our selection of notable events from 2012. With 49,180 students, some 700 faculty, an academic staff of more than 3500 and 2500 support staff, LMU has its largest “crew” for many a year as it sets course for 2012. 2012 marks the 25th anniversary of the founding of the White Rose Foundation. At the annual ceremony in commemoration of the brave members of the White Rose, Professor Peter M. Huber gives an address entitled “It Takes Courage to be Free”. LMU researchers from all across the spectrum of academic disciplines once again show their mettle, as LMU collects more ERC Grants than any other institution in Germany – for projects at the forefront of their respective fields. LMU is formally recognized as a Partner of Top-Level Sport. Arguments for and against the objective value of the various university rankings were aired again in 2012. Suffice it to say here that the internationally most respected classification - the World University Ranking published by the weekly “Times Higher Education” (THE) - put LMU in 42nd slot overall, the best showing by a German university. Indeed, the ETH Zürich and LMU were the only universities in Continental Europe to make it into the Top 50. The first projects to be undertaken as part of the “Pact for Quality in Teaching” get underway at LMU. During the course of the year, many projects designed to enhance the effectiveness of tuition are initiated in the context of the program Lehre@LMU, among them Tutor Plus and the Mentoring Program for First-Year Students. Redefining the term “higher education”, the University takes to the hills. LMU opens a new outstation at 1800 m above sea-level, making it Germany’s highest university. The new telescope at the University Observatory on the Wendelstein will be used to probe the origins and evolution of galaxies and the nature of dark energy. As a founding member of the League of European Research Universities (LERU), LMU participates in an international conference in Barcelona on the occasion of the network’s 10th anniversary. At issue was the question of how Europe‘s universities can best promote the further development of the continent. A clean sweep! – LMU again takes the laurels as the most successful participant in the nationwide Excellence Competition: In the Second Phase of the Excellence Initiative, all of the nine proposals submitted by LMU are approved for funding. An exciting find in the LMU Library makes headlines worldwide: Bibliographers at the University Library discover a hitherto unknown copy of the “pocket edition” of cartographer Martin Waldseemüller’s famous world map, to which America owes its name. The sporting life comes to the fore at LMU as no less than 508 entrants – a new record - turn up for the B2Run. Check out the Picture Gallery. Every year, the Atrium in the Main Building forms the imposing backdrop for the Annual LMU Summer Party. The weather left a lot to be desired, but failed to put a damper on LMU’s biggest student get-together. Picture Gallery. A space as rich in tradition as LMU’s Atrium needs to be spruced up from time to time. So, to stop the rain from seeping through the glass dome and to stabilize the crumbling plaster, the renovators have been called in. They should have the job done by April 2013. But even draped with scaffolding the Atrium is still an eye-catcher. A popular LMU institution gets into double figures – the Unikino completes its first decade: Let it roll! Olympic Gold! LMU student Johanna Welin and her teammates take the Gold Medal in Women’s Wheelchair Basketball at the Paralympics 2012 in London. Of course, the special atmosphere of the Atrium – the usual venue – was missing. Nevertheless, about 8000 new recruits were on hand for the reception to welcome first-year students. Strikingly, the current crop of freshmen is, on average, younger than all its predecessors. Erasmus celebrated its 25th with a birthday party in the Muffathalle. Over 400,000 German students have taken part in the exchange program. Among the guests was No. 400000 - LMU student Dilber Öztürk. Like so many before her, Dilber discovered that Erasmus is not just a matter of amassing ECTS credits. Times Higher Education (THE) World University Ranking: LMU takes 48th place and is again the best of the German universities listed. LMU gets another Humboldt Professor: Stephan Hartmann is the new Professor of the Philosophy of Science. His pithy mission statement: I would find it boring just to collect butterflies. The HighTechCampus in Großhadern/Martinsried looks forward to a new addition, as the foundation stone for the new Research Center for Molecular Biosystems (BioSysM) is laid. LMU students, and their fellows at other third-level institutions in Munich, vote overwhelmingly for the introduction of a season ticket for the city’s public transportation network. After 20 years of discussion and negotiations, the new Semester Ticket will be available in time for Winter Semester 2013/14.